I received an email yesterday that provided me some unexpected closure in a certain area of my life. You may recall that with Sienna, we had backup donors. They had four “top grade” embryos. 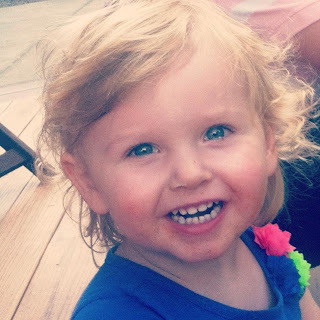 Since we were doing open adoptions, I got to know not only Sienna’s donors, but our backup donors as well. We actually became friends and have remained in communication for nearly two years now. After our success with Sienna, we decided to lovingly return the backup embryos to NEDC. It was an excruciatingly difficult decision. As badly as I wanted to adopt them, my husband and I were just not at the same page at that time with keeping them. We felt that until we were unified in that decision, the right thing to do was to return them in the hopes they would be released from limbo. Months went by and these embryos still were not adopted. That puzzled me, because I knew they were of such a high grade, but I also know that open adoptions are less common than anonymous, so perhaps that was the reason. About a year later, the embryos were adopted. They were again the “backup embryos.” And, again, the couple got pregnant with their “first try” embryos. And, again, that couple lovingly returned the backup embryos to NEDC. After I learned this, I approached my husband again with the possibility of adopting these embryos back. And that’s when he told me that he just did not feel led to do that, and instead felt led toward adopting through our state. Heartbreakingly, I told our backup donors that it was just not meant to be for us, but that I would continue to pray over these embryos, and their fate. During all this time, these backup donors remained steadfastly positive about the fate of their precious embryos, knowing that they would be released at the right time, and to the right couple. A few months ago, they were adopted by a third couple. Recently, the four were thawed, and three survived and were transferred. I’m shocked because it’s just a simple reminder that God is in control of life from beginning to end. Not even the very best in medical technology, science, or the most brilliant and careful doctors and staff can ensure the beginning of life. Life remains the province of our Creator. I also feel a sense of comfort and peace. Comfort for our backup donors that they now feel some rest, knowing the fate of those children. Comfort that God, as painful as it was, steered us away from re-adopting those embryos, which, knowing their fate, would have caused us more heartache and pain. And peace, knowing that for that third adopting couple, while they no doubt are experiencing the heartache and pain of a failed attempt, that God still put this desire in their hearts, and He will be faithful to fulfill it, or take it away. I was talking with someone the other day about when Jeremy and I started wearing glasses and about how bad Jeremy’s vision is. Basically without his glasses he is blind and he started with glasses while in kindergarten after his teacher thought he was making faces at her. In reality, he just couldn’t see. As a follow up question on the conversation the person I was talking to asked if Grant and Maria have bad vision. This type of thing happens quite often where we are talking about a trait, genetic in nature, and the person I’m talking with asks where that comes from or if Jeremy and I were like that. Often times the person knows that Grant and Maria were adopted, but I guess they just forget. For me, I always pause before I answer. Sometimes, I just answer the question that was asked and sometimes I remind them that Grant and Maria were adopted. For many, I guess because I physically gave birth to them, the idea that they are not genetically tied to us isn’t readily on their mind. For me, it’s quite the opposite. There are many days where I observe them and wonder who they are like. Is Grant a clone of his genetic father? (My gut tells me yes.) Who has the gangly toes that Maria inherited? Is one genetic parent focused like Maria and does the other struggle to sit still like Grant? Are they semi-vegetarian like Grant and Maria who will go to town on their fruits and veggies, but lukewarm about meat and cheese? Does one insist on sleeping in socks like Maria and the other content to be barefoot year round? We talk openly about their adoption with them and other people and I actually enjoy answering questions and sharing our story. In fact, one thing Maria loves to do is read the calendar and she points out everyone’s birthdays. When we get to September 17 she now says “that’s the day I went in your belly.” I know she doesn’t understand now, but one day she will and I hope she sees it as special as I do. I might not be able to answer all the questions they have one day, but one thing is for certain they will know they were wanted and that we loved them from before we ever saw their picture as tiny embryos. Yesterday was what we hope is our sixth and final homestudy (apart from maybe a brief follow-up visit or two). It was the first time that Tygh and I actually got to be together for the homestudy since the first visit, many months ago. Again, the caseworker just wanted to fill in holes that she had in her report. She mostly asked about our differing parent styles. I’m much more laid back, and Tygh is more of the “iron fist.” She also wanted to ask more about our children and their personalities. Now, if you know me, I could go on and on and on talking about my kids. But, I quietly deferred to Tygh. It was so fascinating hearing his responses, and watching him as he responded. When he spoke of Brae, his chest puffed up, and he sat up straight. His voice was strong and proud. He talked about how Brae is his shadow, how intelligent and willful he is, how he’s “all boy,” and how Brae owns me (great). When he spoke of Sienna, his chest kind of caved in, he relaxed his posture, and sat back in the chair. His voice was softer and more relaxed. He talked about how she’s shy when she first meets someone, but then she warms up quickly and is a social butterfly. How she loves to take care of things and people, and how she can stand her own against her big brother. And then, he spoke about me. He spoke about how great of a mother I am. How when I’m with the kids, I’m 100% with the kids. How I’m driven and persistent in reaching my dreams, and also loving and compassionate (tears). And then the caseworker said something that really surprised me. Mind you, most of my interactions with my caseworker, while I really like her, have been a bit prickly. I know that’s just part of the process. I’ve gotten the impression she thinks that I’m this tightly-wound woman who needs to take a chill pill. Come to learn, she thinks quite the opposite. That lit up my day. So, next steps are that we have to finish a couple little things around the house (get a new fire extinguisher, get a safe for our medications, etc. ), she writes her report, comes to do one final house walk-through, and then we are allowed to read our report (gulp). As much as I want this homestudy process to just be over with, and have been pushing to just get it done, I truly trust God’s sovereign plan with how and when this next child will come. For now, it seems, we are at least off the roller coaster, and waiting for the next ride. 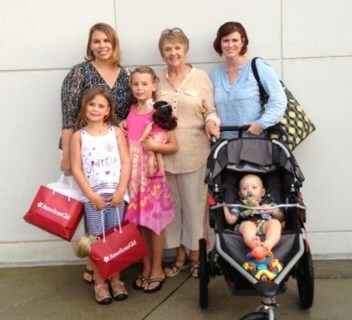 John Luke and I went to Atlanta for a “girls getaway” this past weekend with my sis-n-law, mother-n-law, and two nieces. Before the trip, I was excited to see my family, but nervous at the same time. I often get panicky driving in heavy traffic such as Atlanta. I also know that if I succumb to my fears, I will never go anywhere, and John Luke will miss out on exciting adventures like traveling to different places. So with determination and resolve, we headed off to the big city. I live in a small town with a population of about 5,104 people (2011 census). It’s on the outskirts of a larger town with a population 63,815 people (2011 census). You can get on the other side of town within 20 minutes. I’m glad we went despite my fears. I was nervous about the thought of him getting fussy as we got into Atlanta traffic. We ended up getting lost, but the important thing is we arrived alive and made the effort to see our family. We ate dinner at the hotel Friday night, then spent some time in our room catching up before going to bed. The next day we had brunch at the hotel, then my family went on to the American Girl store while John Luke and I stayed at the room to do my motherly duties (pumping). I met them later at the store, and was quickly amazed at the craze of the American Girl phenomenon. I guess it’s like the frenzy of the Cabbage Patch dolls which were popular when I was a girl. My nieces even had personal shoppers to help them pick out their purchases. I think I’m in trouble if I have a girls next time around! 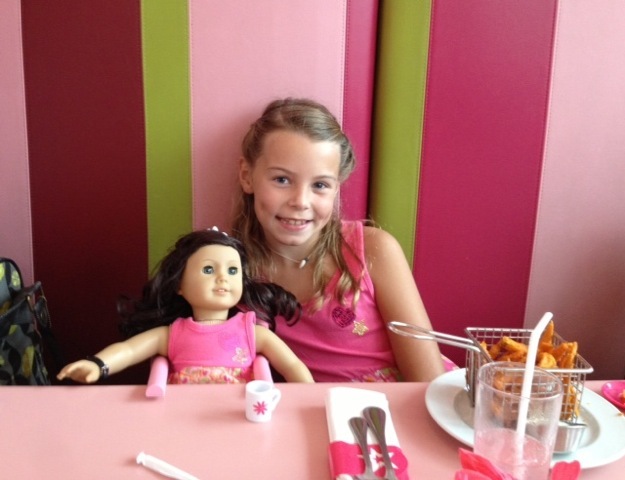 Saturday evening we did some shopping at the mall, then ate at the American Girl Bistro. My nieces were so cute dining with their dolls. 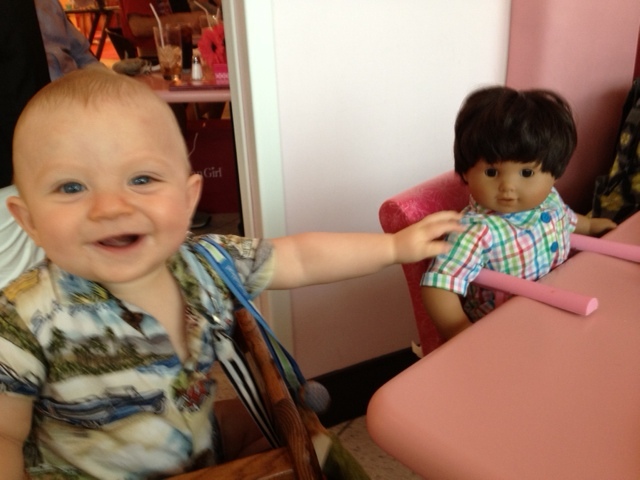 The waitress even brought John Luke a boy doll to the table. It was so funny, I think J L thought the doll was real. J L kept babbling, and trying to touch him. Back at our room, John Luke was fascinated with the floor length mirrored closet door. 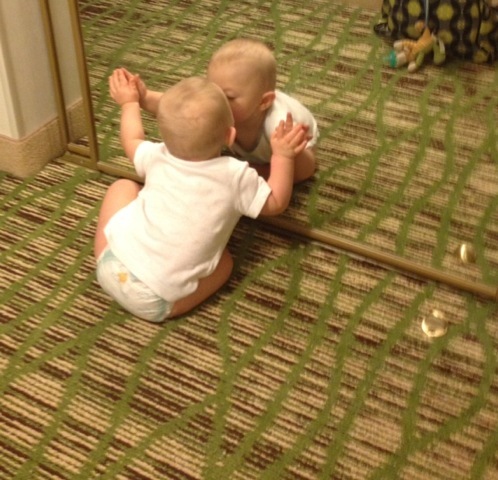 He kept “talking” to the baby in the mirror. I’m not sure if the thought it was someone else, or if he was just amused by his reflection. He even kissed himself a couple of times. We had a fun weekend. We’ll see them in Alabama in two weeks. Here are some pictures from our trip. One of the biggest things I’ve learned in the last three years is that parenting is a game of trial and error. What works for one child will not work for another. For us, discipline has been one of the biggest areas of trial and error and we are figuring out what works. For Grant losing privileges seems to resonate the most. Recently we were walking home from a nearby playground. There is a path that cuts through some property that is mostly gravel and small rocks. Grant picked up the rocks and started throwing them. I asked him to stop. He did for about five steps then picked up another handful and threw it. 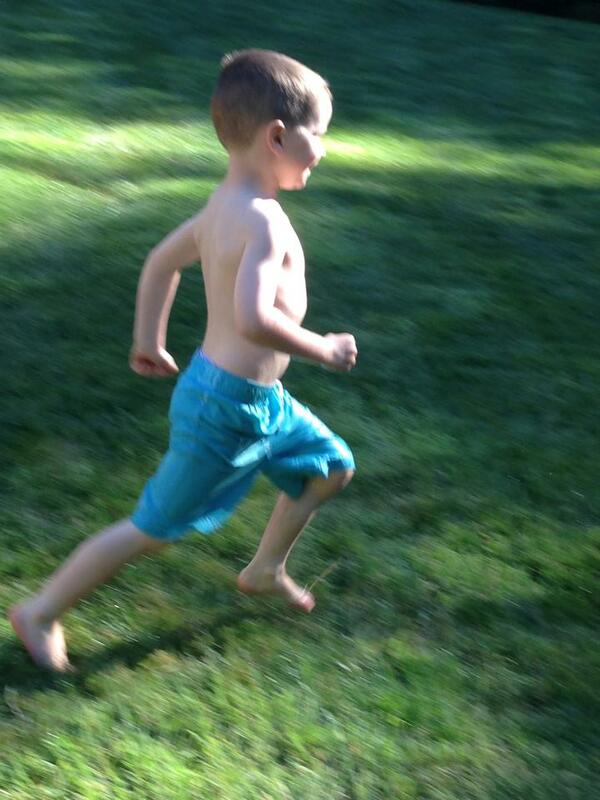 Without hesitation I told him he was not going to get a Popsicle when he got home. For the next 20 minutes he whines and cried and pleads his case. “But, Mom! I’m hot! 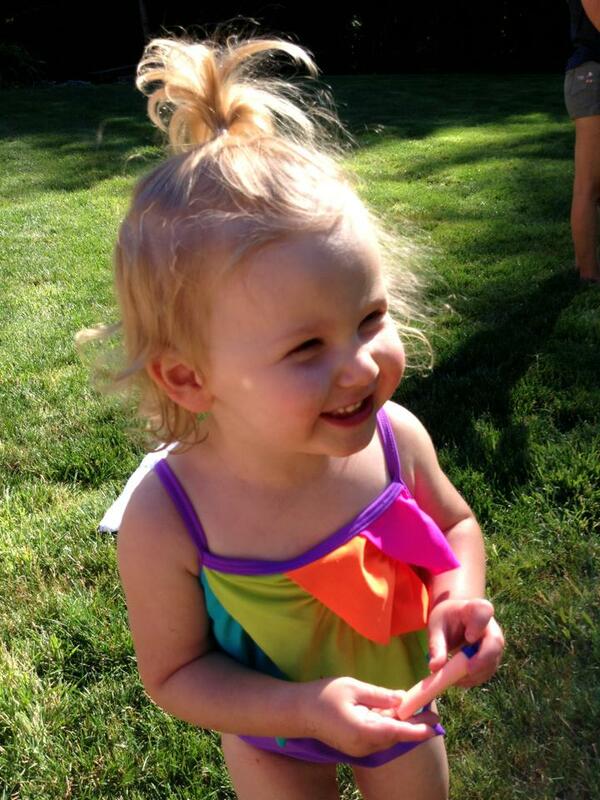 I need Popsicle to cool off.” Meanwhile, Maria enjoyed her Popsicle while Grant whined about his predicament. Fast forward to the next evening while we were getting ready to walk to the playground again. Maria took it upon herself to remind Grant of what happened the day before. “G you need to obey so you get Popsicle. Do you hear me?” He replied “Yes, I need to obey. I can’t throw rocks.” I laughed to myself and reminded them both they needed to listen to me. We didn’t have any issues that night. This week has been trying to say the least. I had this bright idea that I would wean from pumping. John Luke has practically weaned himself from the breast. Once he figured out his surroundings were pretty interesting, it’s been hard to keep his attention at the breast, except in the middle of the night or early morning. We had latching and supply problems in the beginning. As a result, he was introduced to the bottle very early. It’s been a struggle to keep him on the breast every since. I am still pumping 3-4 times per day, but the supply is getting less and less. I’ve spent hours pumping trying to “build up” my supply with very little results. I am only producing about 6 ounces per day now. I have been starting to wonder if the benefits outweigh the time spent, now that he’s almost eight months old. I realize any amount of breast milk is better than formula; however, starting to question whether time spent stimulating his mind with reading and being outdoors would be more productive. Recently, we had a busy weekend with fourth of July activities. I thought I would eliminate a pumping session over the weekend and see how it goes. I pumped less at the other three sessions as well. I usually pump right before bed at least one hour. Thirty minutes on each side to empty the breast as much as possible before going to bed. After eliminating a pumping session, and reducing time spent pumping per session, I have spent a lot of quality time with my pump making up for it. I found myself with a clogged milk duct. And it’s been a dud. I have spent HOURS this week trying to get the duct unclogged. I’ve pumped about an hour at each session, several times per day. I’ve taken hot showers and expressed the milk in the shower. Total waste. The kid gets no benefits from it that way, but the heat from the shower helps get the duct unclogged. I have massaged the affected breast with a hand massager before pumping. Slept with the plugged breasts on a heating pad, and spent time researching how to get the duct unclogged to prevent mastitis. I have a friend who pumped four times per day and eventually dried up without having to wean. I do get a little sad at the thought of not producing anymore milk. It’s good to put on his oatmeal and rice cereal in the morning, and occasionally he gets a full bottle of breast milk. I think I will go back to pumping and let nature take care of itself. It’s hard to believe there is actually a fifth chapter to this saga. Last week, I had my fifth interview with our caseworker. Our caseworker is in the process of writing up our report, and had some holes she said she wanted to fill in. Particularly, she wanted to hear more about my childhood. More about my parents’ divorce. More about my parents’ re-marriages to my stepparents, and my three stepbrothers. She wanted to hear more about my high school and college years. More about my romantic relationships. In all, I’m not sure I’ve ever told one single person as much information as I’ve told this virtual stranger. It’s an exhausting process. Her concern was that we may be placed with a child who has had some trauma in his/her life, and it could be a trigger for me, and what was I willing to do about it? I told her that I have been on several missions trips to very impoverished parts of our country, and our world. I have witnessed children who do not have shoes on their feet, running water, and struggle for every morsel of food. I have mentored children whose fathers have abandoned them, who have been physically or sexually abused, and neglected. In comparison, my childhood was a piece of cake. I’m not trying to minimize divorce, and the profound impact it has on children, including me. Looking back, that one incident was a catalyst for a lot of unpleasant experiences in my life. However, I do not compare it to being beaten, raped, or starved. So, forgive me if I tend to shrug my experience of divorce off. In comparison, it was not that bad. My parents each re-married, and have been re-married for over 25 years. I’ve seen beauty rise from the ashes that divorce creates. Including myself. Of course, I told her that if a child we bring home causes a trigger in me, I will not hesitate to seek counseling. And, I mean that. We hope to have our next (and final!) homestudy visit in the next week or so, and then we wait for the final report to be written. It will be so nice to have this part of the process behind us.